STANDISH — A new report highlights the need for a standalone indoor community center with a variety of activity spaces in Standish. The 2019 Parks & Recreation Needs Assessment and Planning Final Report was recently completed by the University of New Hampshire’s Department of Recreation Management and Policy. Standish decided last year to examine the town’s parks and recreation needs, with a specific focus on indoor recreation space. “The idea was to explore what the needs are in the community, both programming needs and to help fulfill the needs for indoor recreation space in town,” said Parks and Recreation Director Jen DeRice. Information was gathered through 11 focus groups and town-wide surveys, 436 of which were returned. According to the report, the focus groups highlighted that residents are interested in creating a stronger sense of community and that the parks and rec department should focus on improving communication and visibility. Surveys asked participants about their use of recreation facilities and amenities in Standish, their perception of the qualities of the facilities, constraints to recreation participation and recreation facility needs. Over 70 percent of participants agreed or strongly agreed that the town needs a town-supported indoor recreation/community center. Most participants strongly or moderately agreed that Standish needs a teen/youth center, indoor swimming pool, multipurpose gyms and a jogging/walking track. They also wanted after-school programs, summer day camps, group fitness programs and other activities. In the open-ended response portion of the survey, residents also asked for groomed Nordic ski trails, batting cages, a shooting range and safe sidewalks and walkways. They contributed additional program ideas that included kayaking, archery and horseback riding trails. Some residents emphasized the importance of keeping children healthy and active during the winter while others lamented having to drive to nearby towns for activities and facilities. Many participants hoped that a community center would bring the community together and create a space for residents to congregate and socialize, especially children and senior citizens. According to the report’s findings and recommendations, the community center should have spaces dedicated to the needs of specific age groups and should host a variety of community and civic activities. Proposed next steps include issuing a request for proposals for a community center feasibility study; investigating alternative sources of funding for the project; and increasing awareness of parks and rec programs and services. DeRice said the parks and rec department can immediately start to address communication and outreach issues. The next step is finalizing the year’s budget. “We’ve put money in there for a feasibility study to solicit a firm to come do a study,” DeRice said, which will investigate how much the project would cost and what its impact would be on local taxes. “After this budget is approved in July, we can start right away. The ultimate goal is to be able to bring this to a referendum eventually and see if the community wants to do it or not,” she continued. Standish engaged in a community needs assessment process in 2006 to complete an analysis and cost estimate for an indoor community center. However, the economic downturn in 2008 tabled the discussion. “We’re excited about this prospect. It will open so many more doors for us,” DeRice said. 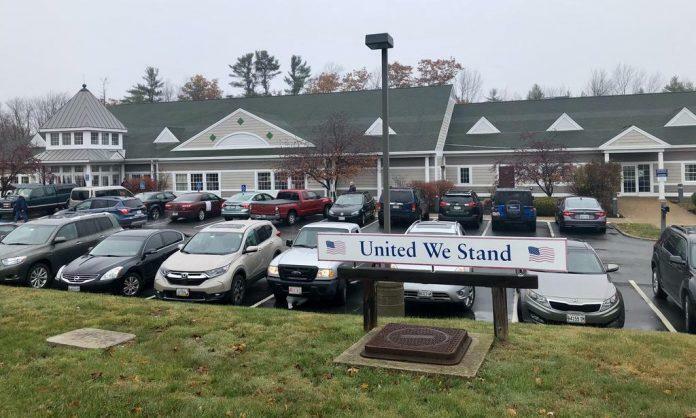 The Standish Parks and Recreation Department is located in the town hall, but it could be relocated to the community center if constructed.